I just could not resist the urge to share these ideas with you. Following is implementation using the Systematic Investor Toolbox. Please enjoy and share your ideas with David and myself. bt.adjusted.momentum.test() function in bt.test.r at github. Hi, thank you for doing this. Why don’t you have the same results ? Thanks for posting – this isn’t the first time you’ve published source code that clarifies formulas discussed in others’ posts – well done, again. 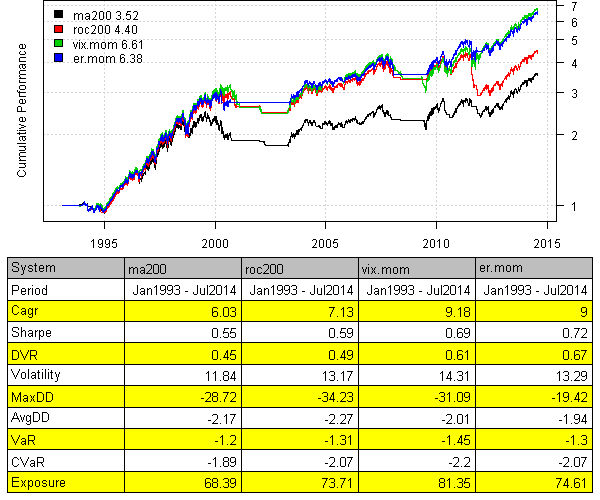 I note that in Varadi the ER-MOM achieves a 10.7 CAGR vs VIX-MOM’s 10.1, while in the results here the tally is ER-MOM = 9 and VIX-MOM = 9.16, both less and opposite in winning strategy. Do you know if the delta is due to time frame (Varadi starts in Sept 94) or perhaps you’ve included slippage? Any insight appreciated. I hate magic numbers: So, I reject my own tuning except for the fun it gave me to do it. But, shorting appears righteous.